Ferrets make wonderful companions. They are cute, intelligent, and friendly. These furry friends will keep you busy, though, as they require a lot of attention and specialized care. 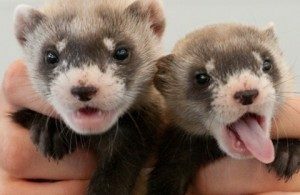 Ferrets, like cats and dogs, require regular veterinary care so adding a ferret to your home means adding veterinary bills. Essentials for preparing your home for a ferret include a wire mesh cage that provides adequate ventilation. Ferrets also thrive in multi-level cages to give them added exercise. You will need a water bottle, food dish, litter box, swing, and bed. These should all fit nicely within the cage for your ferret friend. Essentials for care outside of the cage include nail clippers, a carrier for transportation to the veterinarian, toothbrush, toothpaste, ear washes, shampoos and conditioners. Ferrets enjoy toys and often like to chew so watch your shoes! Ferrets enjoy to go outside in nice weather so be sure to purchase a harnesses and leash. Ferrets can be trained using treats and enjoy playing and taking on challenges. Now that you have your essential needs list for your ferret, I must tell you that these animals require a great deal of care and maintenance. These animals need to have daily interaction and their cages must be meticulously kept. When happy they make the cuddliest furry friends.